This is EM Cases Episode 104 – Emergency Management of Intracerebral Hemorrhage – The Golden Hour with Scott Weingart and Walter Himmel. With special guest appearances by Rob Simard and Peter Brindley. Can intracerebral hemorrhage vs ischemic stroke be predicted accurately before CT? Clinical findings that significantly increase the probability of ICH include altered level of awareness, neck stiffness, seizures, DBP>110, bilateral neurologic findings, vomiting and headache. However, no combination of clinical findings can be absolutely diagnostic. POCUS transcranial doppler and optic nerve sheath diameter may help increase your suspicion for ICH in the setting of abrupt onset neurologic symptoms. Raised ICP is more in keeping with ICH than with ischemic stroke. An optic nerve sheath diameter of >6 mm is highly specific for raised ICP while an optic nerve sheath diameter of <5 mm is highly sensitive for ruling out raised ICP. Transcranial doppler is able to detect both emboli and stenosis of the MCA helping to rule in an ischemic stroke. It can also help predict midline shift from ICH, as well as sometimes identify an ICH lesion. More evidence and experience with transcranial doppler is needed to determine its role in the workup of ICH. Patients with ICH who you deem at risk for aspiration (nausea, retching, vomiting, low GCS, apneic, herniating etc) should be considered for airway control before CT (see airway management below). For the patient who presents with stroke symptoms within a few hours of onset, whether you consider them more likely to have ICH vs an ischemic stroke, if SBP is greater than 180, our experts recommend titrating the SBP down to 180 before the diagnosis is confirmed by CT, if time permits. While there is a long list of causes of ICH, the most common causes of ICH include hypertension (which tend to cause deep brain basal ganglia, brain stem and cerebellar bleeds) and amyloid angiopathy usually seen in elderly patients (which tend to cause large lobar bleeds). It is important to identify two other important causes of ICH in the ED, coagulopathy associated ICH and cerebral venous thrombosis, as they require specific time-sensitive treatment. While many centers will automatically perform plain CT, CT angiogram and perfusion CT for all patients who present to the ED with a clinical picture consistent with stroke, other centers may only perform plain CT in the ED in patients who do not fulfill criteria for a “code stroke” and leave other imaging to be considered by the inpatient team. Our experts recommend that all patients with ICH should receive a CT angiogram in the ED for both diagnostic/therapeutic and risk stratification considerations. What is the target BP in intracerebral hemorrhage? Based on the INTERACT2 and ATTACH2 trials our experts suggest that for those patients with ICH with GCS scores >7, lowering BP to 140/80 is not harmful and may be minimally beneficial. Hypotension (MAP <75-80) should be avoided at all costs in patients with ICH. Nicardipine is the antihypertensive agent of choice in ICH because it does not affect the ionotropy of the heart, and being a pure arterial vasodilator it has no significant effect on cerebral vasodilatation or venous dilatation. For centers without nicardipine available, labetolol is the antihypertensive agent of choice in ICH. The absolute indication for platelet transfusion in patients with ICH is a platelet count <50,000. However, most hematologists and neurosurgeons recommend platelet transfusion for ICH with a platelet count <100,000 despite the lack of evidence for improved outcomes, especially if the patient requires emergency surgery. Is there any benefit of platelet transfusion for patients taking antiplatelet agents in ICH? While there are some observational studies suggesting potential benefit from platelet transfusion, the PATCH trial of 2016, a multicenter open label RCT in Netherlands, UK and France randomised 190 patients with supratentorial ICH and GCS >8 who had received antiplatelet therapy (mostly ASA alone) within 7 days to standard care vs care with platelet transfusion. An ordinal analysis looking at modified Rankin Score and death showed an odds ratio of death of 2.05 with the treatment group. More serious adverse events were reported in patients who received platelet transfusion (42 %), compared with 29 % in patients who received standard care alone. They concluded that platelets were associated with poorer clinical outcomes overall. It is important to note that these patients were primarily nonsurgical ICH patients. For patients requiring emergency surgery most neurosurgeons do recommend platelet transfusion for patients taking antiplatelet agents. It is also important to note that patients with subarachnoid hemorrhage or traumatic intracerebral hemorrhage taking antiplatelet agents may require platelet transfusion as well. Any patient taking Warfarin who presents to the ED with ICH should receive IV 4 factor PCCs 1,500 units (Octaplex, Beriplex or Kcentra) as soon as possible and IV Vitamin K in 50mL of NS over 10 mins before the INR result comes back, as hematoma expansion typically occurs within the first hour in patients taking Warfarin. The INR should be repeated 15 mins and 5-6 hours after PCCs are administered to assess for repeat dosing if necessary. Target an INR of 1.5. For enoxaparin taken within 8 hrs: IV protamine sulpahate 1mg of every 1 mg enoxaparin to maximum dose of 50mg over 15 mins. For enoxaparin taken 8-12hrs ago, give protamine sulphate 0.5mg per 1mg of enoxaparin (maximum single dose 50mg). For UFH: IV protamine sulphate 1mg for every 100 units of UFH given in the previous 2-3hrs to a maximum single dose of 50mg). A repeat dose of 0.5mg of protamine per 100 units of UFH may be given if the PTT remains elevated. For Xa inhibitors (e.g. apixaban, rivaroxaban) 4-factor PCC (Octaplex, Beriplex, Kcentra) at a dose of 50 IU/kg up to 3,000 units is the reversal agent of choice based on limited evidence. Note that if you highly suspect a Xa inhibitor intracranial bleed before obtaining a CT head, it is reasonable to give 1,500 units of 4 factor PCC on speculation. Andexanet Alfa is a decoy antigen; it competitively binds rivaroxaban and apixaban and is given as an ongoing infusion. The evidence is not convincing for its effectiveness and it is currently not available in Canada as of this publication date. Time is of the essence. Careful monitoring of your ICH patient should allow rapid identification of post-lytic ICH. Any change in mental status or signs of increasing ICP should trigger an immediate CT scan to look for ICH. The sooner you start treatment, the better. The most recent guidelines for treatment of post-thrombolytic ICH are the 2016 Neurocritical Care Society & Society of Critical Care Medicine Guidelines for Reversal of Antithrombotics in ICH. Based on limited evidence, they recommend cryoprecipitate (10 units initial dose). If cryoprecipitate is contraindicated or not available in a timely manner, they recommend tranexamic acid 10–15 mg/kg IV over 20 min. However, our experts recommend caution with the use of tranexamic acid for ICH because of concerns of inducing thrombosis. As such it should be used only as a last resort. It is important to check the fibrinogen level after administration of reversal agents. If the fibrinogen level is < 150 mg/dL, they suggest administration of additional cryoprecipitate. Hyperglycemia is common in patients presenting with ICH. Hyperglycemia is associated with poor outcomes(hematoma expansion, increased edema, death, or severe disability). The optimal glucose level and the best hyperglycemia management strategy remain to be elucidated. However, both hypoglycemia (<70 mg/dl or < 3.9 mmol/L) and hyperglycemia (>180 mg/dl or 10 mmol/L) should be avoided. A study suggested improved clinical outcomes with tight control of blood sugar to the range of 80–110 mg, but this was found to cause occasional hypoglycemia resulting in increased mortality. Bottom line: do not treat glucose between 4 and 10 mmol/L. So called ‘brain blood fever‘ is common in ICH with 30- 50 % of patients developing fever. The presence of intraventricular hemorrhage is the main risk factor for fever. Fever is independently associated with poor outcomes in ICH with the duration of fever varying inversely with the patient outcome. While there are no available data from RCTs addressing the role of induced normothermia after ICH, current recommendations are to cool febrile ICH patients to a core temperature below 37.5-38 °C. Bottom line: avoid fever in ICH. Is there a role for seizure prophylaxis in ICH? About 10-15% of patients will have a seizure with most of those occurring in the first 24hrs, so very possibly in your ED on your watch. Lobar hemorrhages are at particular risk of causing seizures. Prophylactic anticonvulsants are associated with worse clinical outcomes such as modified Rankin Score 1 and 4 months. However, if the patient is comatose “out of proportion” to CT head findings, consider EEG monitoring to pick up subclinical seizures. For those patients in category one, perform a standard RSI. For those patients in category two, perform a neurocritical care protective intubation. Ensure good neurologic exam before paralyzing the patient if time permits. 9. Ventilation: Lung protective ventilation 7mL/kg, +/- lowest PEEP to achieve O2sat 95%, normocapnea at PaCO2 of about 40 unless herniating (target PaCO2 30-35 or ETCO2 27-30 if herniating). Based on ICP monitoring, POCUS optic nerve sheath diameter >6mm or clear signs on CT of elevated ICP (not for low GCS alone) consider hypertonic saline, mannitol or sodium bicarbonate. Hypertonic saline 3% 250mL over 10 minutes is preferred by our experts because there are less concerns with sodium derangement and changes in hemodynamics. If you use mannitol it is advisable to place a bladder catheter and match urinary losses with normal saline administration to avoid hypotension. A simple way to give mannitol to maximize efficiency and decrease cognitive load is to give one big bag (500mL containing 100g as a 20% solution) for a big patient or one small bag (250mL containing 50g as a 20% solution) for a small person. This roughly estimates the 0.5-1g/kg dose that is recommended. Note that a meta-analysis by Burgess et al (2016) found no difference in outcomes between hypertonic saline and mannitol in traumatic brain injury. Prognostication: What are the predictors of poor outcome in ICH? While a high ICH score of 5 or 6 predicts a 100% 30 day mortality at a population level, early prognostication for individual patients is often challenging and difficult to predict. Withdrawal of care should generally not be decided in the ED. The two most important predictors of early deterioration are hematoma volume and intraventricular hemorrhage. The spot sign on contrast CT represents contrast extravasation and is an independent predictor of hematoma expansion, functional outcome and mortality. Patients with a spot sign on CT may benefit from more aggressive treatment to reduce hematoma expansion, improve functional outcome and decrease mortality. Surgical intervention in ICH is indicated for all posterior fossa bleeds except those patients with GCS of 14-15 and small hematomas <3cm to prevent acute hydrocephalus and brainstem herniation. Intraventricular hemorrhage requires an intraventricular drain. De oliveira manoel AL, Goffi A, Zampieri FG, et al. The critical care management of spontaneous intracranial hemorrhage: a contemporary review. Crit Care. 2016;20:272. Broderick JP, Brott T, Tomsick T, et al. Intracerebral hemorrhage more than twice as common as subarachnoid hemorrhage. J Neurosurg 1993;78(2):188–91. Stevens RD, Shoykhet M, Cadena R. Emergency neurological life support: intracranial hypertension and herniation. Neurocrit Care. 2015;23 Suppl 2:76–82. D’andrea A, Conte M, Riegler L, et al. Transcranial Doppler Ultrasound: Incremental Diagnostic Role in Cryptogenic Stroke Part II. J Cardiovasc Echogr. 2016;26(3):71-77. Schatlo, B Pluta, RM. Clinical applications of transcranial Doppler sonography. Rev Recent Clin Trials. 2007;Jan 2(1): 49-57. Meyer-Wiethe et al. Diagnosis of ICH with Transcranial ultrasound. Cerbrovasc Dis. 2009;27 Suppl 2:40-7. Scott Weingart. Podcast 129 – LAMW: The Neurocritical Care Intubation. EMCrit Blog. Published on July 26, 2014. Scott Weingart. Podcast 78 – Increased Intra-Cranial Pressure (ICP) and Herniation, aka Brain Code. EMCrit Blog. Published on July 22, 2012. Specogna AV, Turin TC, Patten SB, Hill MD. Factors associated with early deterioration after spontaneous intracerebral hemorrhage: a systematic review and meta-analysis. PLoS One. 2014;9(5):e96743–3. doi:10.1371/journal.pone.0096743. Hemphill JC 3rd, Greenberg SM, Anderson CS, et al. Guidelines for the management of spontaneous intracerebral hemorrhage: a guideline for healthcare professionals from the American Heart Association/American Stroke Association. Stroke 2015;46(7):2032–60. Kate MP, Hansen MB, Mouridsen K, et al. Blood pressure reduction does not reduce perihematoma oxygenation: a CT perfusion study. J Cereb Blood Flow Metab. 2013;34(1):81–6. doi:10.1038/jcbfm.2013.164. Kothari RU, Brott T, Broderick JP, et al. 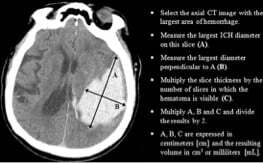 The ABCs of measuring intracerebral hemorrhage volumes. Stroke 1996;27(8):1304–5. Hemphill JC 3rd, Bonovich DC, Besmertis L, et al. 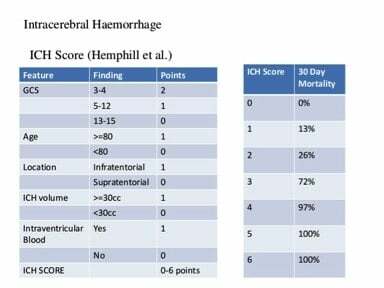 The ICH score: a simple, reliable grading scale for intracerebral hemorrhage. Stroke 2001;32(4):891–7. Wang CW, Liu YJ, Lee YH, et al. Hematoma shape, hematoma size, Glasgow Coma Scale score and ICH score: which predicts the 30-day mortality better for intracerebral hematoma? PLoS One 2014;9(7):e102326. Anderson CS, Heeley E, Huang Y, et al. Rapid blood-pressure lowering in patients with acute intracerebral hemorrhage. N Engl J Med. 2013;368(25):2355-65. Bourdeaux CP, Brown JM. Randomized controlled trial comparing the effect of 8.4% sodium bicarbonate and 5% sodium chloride on raised intracranial pressure after traumatic brain injury. Neurocrit Care. 2011;15(1):42-5. Burgess S, Abu-laban RB, Slavik RS, Vu EN, Zed PJ. A Systematic Review of Randomized Controlled Trials Comparing Hypertonic Sodium Solutions and Mannitol for Traumatic Brain Injury: Implications for Emergency Department Management. Ann Pharmacother. 2016;50(4):291-300. Casaubon LK, Boulanger JM, Blacquiere D, et al. Canadian Stroke Best Practice Recommendations: Hyperacute Stroke Care Guidelines, Update 2015. Int J Stroke. 2015;10(6):924-40. Raffiz M, Abdullah JM. Optic nerve sheath diameter measurement: a means of detecting raised ICP in adult traumatic and non-traumatic neurosurgical patients. Am J Emerg Med. 2017;35(1):150-153. Passero S, Ciacci G, Ulivelli M. The influence of diabetes and hyperglycemia on clinical course after intracerebral hemorrhage. Neurology. 2003 Nov 25;61(10):1351-6. NICE‐SUGAR Study Investigators, Finfer S, Chittock DR, Su SY‐S, Blair D, Foster D, et al. Intensive versus conventional glucose control in critically ill patients. N Engl J Med. 2009 Mar 26;360(13):1283-97. Frontera JA, Iii JJL, Rabinstein AA, et al. Guideline for Reversal of Antithrombotics in Intracranial Hemorrhage: A Statement for Healthcare Professionals from the Neurocritical Care Society and Society of Critical Care Medicine. Neurocrit Care. 2016;24(1):6–46. doi:10.1007/s12028-015-0222-x. Sansing LH, Messe SR, Cucchiara BL, Cohen SN, Lyden PD, Kasner SE. Prior antiplatelet use does not affect hemorrhage growth or outcome after ICH. Neurology. 2009;72(16):1397–402. Messé S, Sansing L, Cucchiara B, et al. Prophylactic antiepileptic drug use is associated with poor outcome following ICH. Neurocrit Care. 2009;11(1):38-44. Frontera JA, Lewin JJ, Rabinstein AA, et al. Guideline for Reversal of Antithrombotics in Intracranial Hemorrhage: Executive Summary. A Statement for Healthcare Professionals From the Neurocritical Care Society and the Society of Critical Care Medicine. Crit Care Med. 2016;44(12):2251-2257. Naidech A, Garg R, Liebling S, et al. Anticonvulsant use and outcomes after intracerebral hemorrhage. Stroke. 2009;40(12):3810-3815. Mendelow AD, Gregson BA, Rowan EN, et al. Early surgery versus initial conservative treatment in patients with spontaneous supratentorial lobar intracerebral haematomas (STICH II): a randomised trial. Lancet. 2013;382(9890):397–408. Teernstra OP, Evers SM, Lodder J, Leffers P, Franke CL, Blaauw G. Stereotactic treatment of intracerebral hematoma by means of a plasminogen activator: A multicenter randomized controlled trial (SICHPA). Stroke 2003;34(4):968-974. Hanley DF, Thompson RE, Muschelli J, et al. Safety and efficacy of minimally invasive surgery plus alteplase in intracerebral haemorrhage evacuation (MISTIE): A randomised, controlled, open-label, phase 2 trial. Lancet Neurol 2016;15(12):1228-1237. Mould WA, Carhuapoma JR, Muschelli J, et al. Minimally invasive surgery plus recombinant tissue-type plasminogen activator for intracerebral hemorrhage evacuation decreases perihematomal edema. Stroke 2013;44(3):627-634. Vespa P, Hanley D, Betz J, et al. ICES (intraoperative stereotactic computed tomography guided endoscopic surgery) for brain hemorrhage: A multicenter randomized controlled trial. Stroke 2016;47(11):2749-2755. Naidech AM, Garg RK, Liebling S, et al. Anticonvulsant use and outcomes after intracerebral hemorrhage. Stroke. 2009;40(12):3810–5. Kamel H, Navi BB, Nakagawa K, Hemphill JC, Ko NU. Hypertonic saline versus mannitol for the treatment of elevated intracranial pressure: a meta‐analysis of randomized clinical trials. Crit Care Med. 2011 Mar;39(3):554-9.